We're halfway through 2015, so let's take the temperature of the programming language popularity scene again using data from GitHub, SO, Dice, and the IT Salary guide. Even the most polyglot developer can’t be fluent in every computer language that might have some value. So the question of which languages to focus on is a perennial issue for many programmers. And because the popularity of different languages varies over time, it’s essential to know which languages are becoming more popular and which ones are on the decline. So we took another look at various listings of what languages employers are looking for and what languages people are discussing. While the analysis is complicated by the fact that various indices track different metrics in different ways, it turns out that the language landscape seems to have remained fairly stable, at least at the top. C and Java have traded their top slots on at least one popular list, but remain neck and neck. Farther down the leaderboards, XML has faded in at least one instance, while Go and Swift especially are rising in other rankings. There are more changes farther down the list. Last year .NET, HTML, and XML were all pretty much tied for the 4th through 6th spots. But XML has fallen off by 17% this year, dropping it into a near-tie with CSS. Many programmers now consider JSON a superior language to XML, but since the former’s numbers aren’t big enough to make Dice’s top 10, there’s not enough data here to say if JSON’s rise is the reason for XML’s decline. 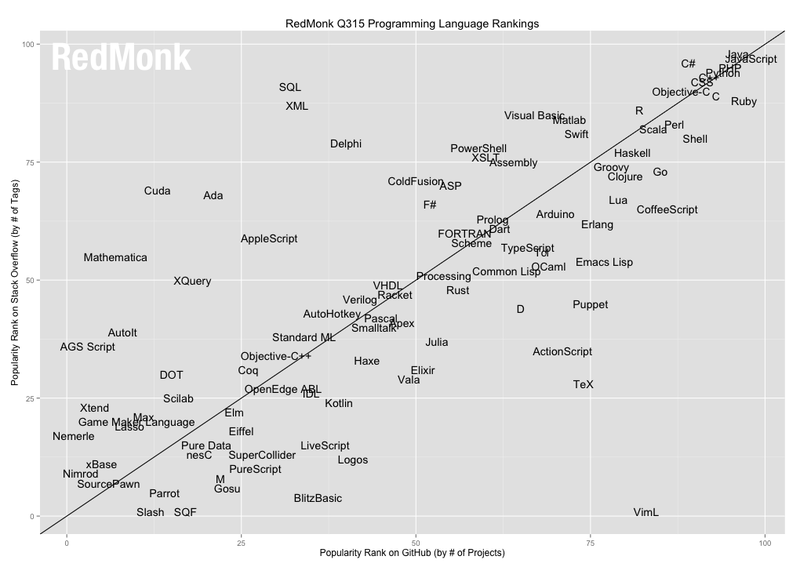 See RedMonk’s programming language-ranking chart here. It’s worth noting that while Dice’s job listings and RedMonk’s activity analysis produce different results, internally at least, both lists are quite stable over time. To put it in perspective, we asked John Reed, senior executive director of staffing firm Robert Half Technology, for comment. (The company produces an annual IT Salary Guide covering trends and salary data for a wide range of IT fields—including those requiring programming skills.) “Our view of the market and the needs of our clients seem relatively consistent with [RedMonk’s] list,” Reed said. “Database analysts with NoSQL and Hadoop are in high demand right now, as well as Web developers with mobile/responsive design experience.” Reed also cited widespread need for programmers with Ruby on Rails and open source experience.